Education Doctor of Physical Therapy, Evidence in Motion Bachelor of Science in Physical Therapy, University of Hartford Bachelor of Science in Exercise Science and Cardiac Rehabilitation, Ithaca College Certifications Board Certified Orthopaedic Specialist Graston Technique® Trigger Point Dry Needling Clinical Specialties Post-surgical rehabilitation and sports medicine, as he’s worked with many athletes at professional, collegiate and high school levels. Organization Memberships American Physical Therapy Association Outside of the clinic… Steve loves spending time with his wife and their three children. He’s very active in coaching both youth basketball and soccer. Steve is Partner for both Guilford and Wallingford PTSMC clinics. Education Master of Science in Physical Therapy in 2001, Quinnipiac University Bachelor of Science in Health Science in 1999, Quinnipiac University Certifications McKenzie Mechanical Diagnosis and Treatment Certified Therapist Graston Technique® Clinical Specialties Mechanical diagnosis and treatment of the spine, orthopedics, sports-related injuries, and pre and post natal patients. Organization Memberships Silver Cities BNI, President Outside of the clinic… In her free time Michelle enjoys scrapbooking, cross-stitching, reading, and swimming. She also loves spending time with her twin girls. Education Doctor of Physical Therapy in 2011, College of St. Catherine Bachelor of Science in Physical Therapy in 2009, College of St. Catherine Certifications Board Certified Orthopaedic Specialist LSVT BIG Certified Therapist Graston Technique® Certified Manual Therapist, Evidence in Motion Clinical Specialties Parkinson’s treatment therapy (LSVT BIG), orthopedic manual therapy, post-surgical rehabilitation, sports-related injuries, pre and post natal care, and treatment of the pelvic floor. Organization Memberships American Physical Therapy Association Connecticut Physical Therapy Association Outside of the clinic… Danielle enjoys hiking, traveling, cooking and spending time with her husband and three children. Education Doctor of Education in Health Profession Education and Cognitive Psychology in 2017, University of St. Augustine Master of Science in Physical Therapy in 2006, Quinnipiac University Bachelor of Science in Athletic Training and Sports Medicine in 2003, Quinnipiac University Certifications Graston Technique® Trigger Point Dry Needling Certified Athletic Trainer Selective Functional Movement Assessment (SFMA) Clinical Specialties Post-surgical rehabilitation and sports medicine for professional, collegiate, high school and youth athletes. Awards & Honors 2017 Outstanding Student Achievement Award for Doctoral Dissertation, University of St. Augustine 2015 Excellence in Teaching Award Recipient, Quinnipiac University Organization Memberships American Physical Therapy Association National Athletic Trainers’ Association Connecticut Athletic Trainers Association Outside of the clinic… Ken is a full-time faculty member in the Quinnipiac University Physical Therapy Department. He enjoys playing golf, exercising, and spending time with his wife and son. He loves sports and is an avid fan of the NY Giants, Mets, Rangers and Quinnipiac Bobcats! 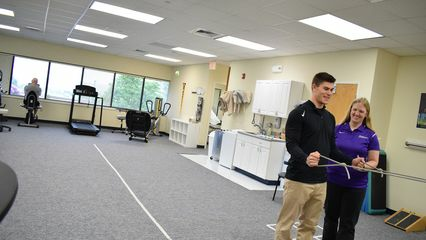 Education Doctorate of Physical Therapist in 2018, Quinnipiac University Bachelor of Health Science in 2015, Quinnipiac University Training & Certifications Graston Technique® for Soft Tissue Mobilization Member, APTA and CPTA Clinical Interests Orthopedics and Sports Medicine, Manual Therapy, Post-Surgical Rehabilitation and Sports-Related Injuries. Outside the clinic… In her free time, Ashley loves to be outdoors, whether hiking, biking or kayaking. She enjoys spending time with her family and two puppies in New Hampshire and is a big hockey fan, rooting for the NHL’s Boston Bruins.